Greetings from London! I have successfully made it across the pond and I am exploring all that London has to offer. 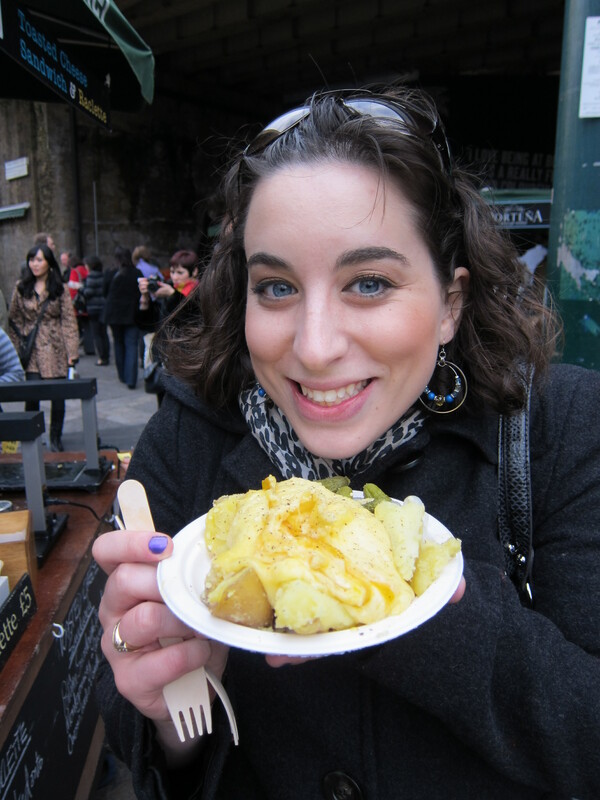 I took Shannon’s advice and immediately asked my friend to take me to Borough Market. The market takes place every Thursday, Friday and Saturday, so if you have a free weekend in London, you need to make this a priority stop. This place truly is a foodie’s dream! There was fresh cheeses, olives, breads, cakes and wine. It definitely brought me back to my study abroad days in Italy, when I would wonder the weekly town markets to find hidden food treasures. Stone beer! 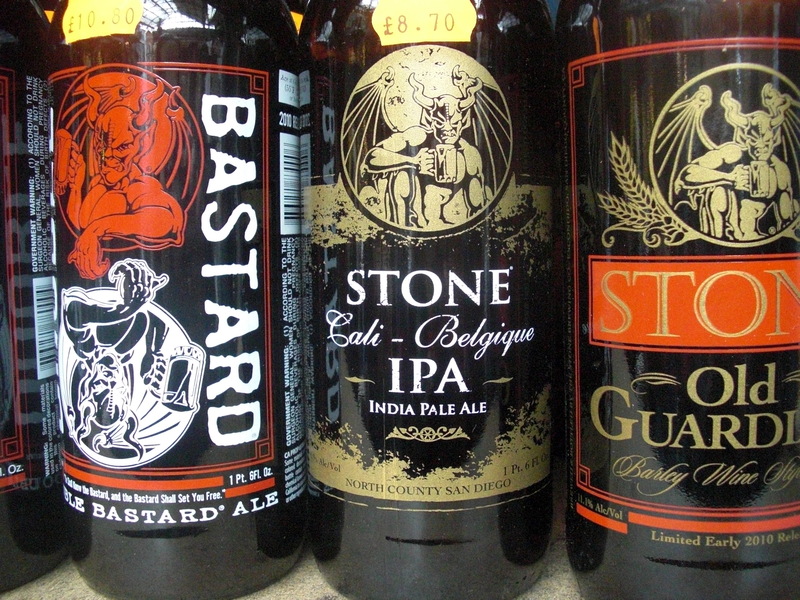 Stone Brewing Co. is a microbrewery in Escondido (San Diego). They have free tours of the facility if you’re ever in the San Diego area, which includes a free tasting. When you go, have a beer in my honor. Mmmm. I know this is a baking blog, but I just HAD to post about the incredible meal I had at the market. 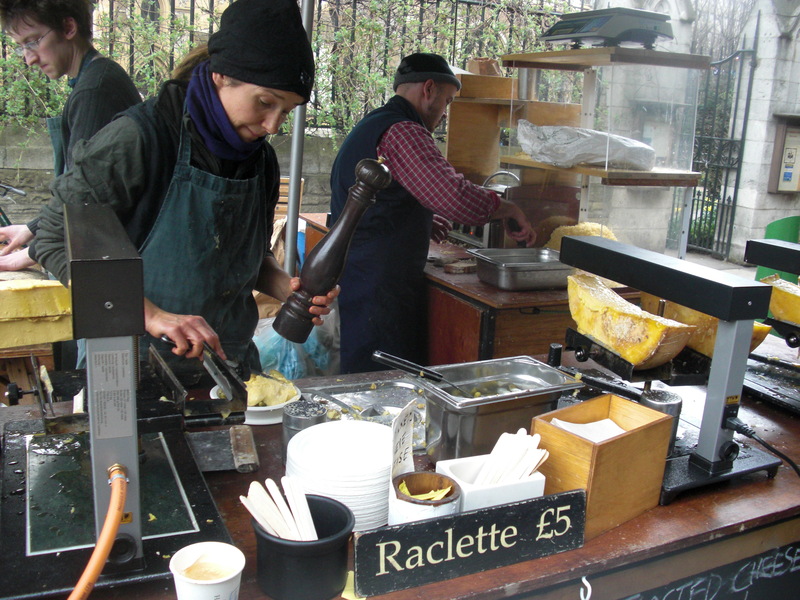 After walking through the delicious maze of vendors, my friend Lisa took me to her favorite stand at the market, where we got a raclette and a toasted cheese sandwich. 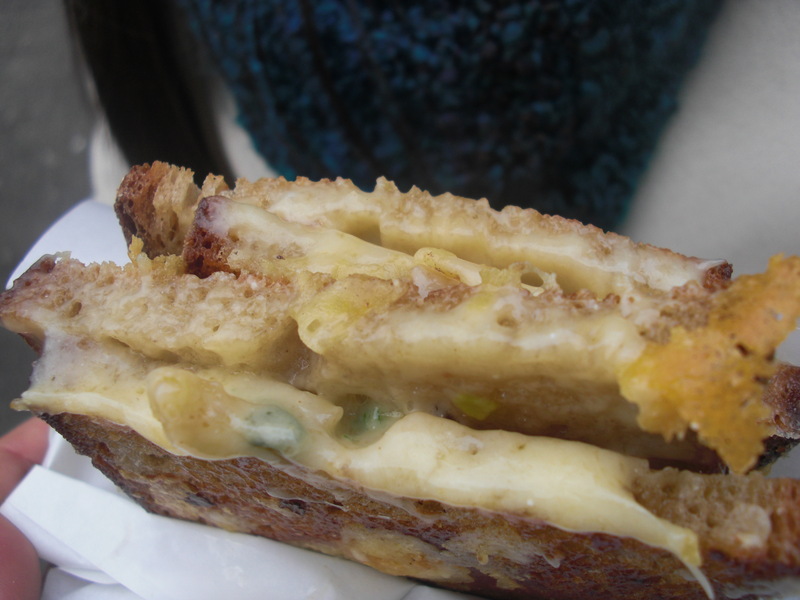 While grilled cheese may be an American staple, the sandwiches I’ve had in the States are NOTHING compared to this ooey, gooey, cheesey, AMAZING sandwich! The secret is the freshly melted cheddar cheese. These talented cook melt huge blocks of cheese under a broiler, and then scrape off the gooey-goodness right onto your plate. Then it goes right into your mouth. YUM! Paired with a raclette dish (potatoes, melted cheddar cheese, onions and gherkins aka pickles), this was the best “I’m jet-lagged, hungry and been up all night-and-day” meal. I’m patiently waiting for Thursday so I can go back and get a second helping. Although since I’ll be alone this time, I’ll most likely go only for the toasted cheese sandwich. Next on my London agenda is an English tea, complete with scones an clotted cream. Pictures and blog post to follow. I hope that everyone is enjoying their spring break, and has found lots of time for baking! Remember, it’s a cake walk! And as they say in London, cheers mate! This is the story about a girl and her KitchenAid, having adventures in the kitchen. Stay for one more piece of cake, won't you?